I really like this post about anniversary stories by John McIntyre, former head of the Baltimore Sun's copy desk. It's from his blog called "You Don't Say." I'm not against all anniversary stories, it's just that sometimes I'd like us to think harder about how we do them -- to push ourselves to not do what McIntyre talks about -- and also to be open to the idea that we don't ALWAYS need an anniversary story on the anniversary of something. 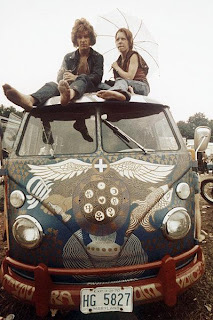 I wasn't at Woodstock: "Few things in journalism bear as strong a sense of inevitability as the anniversary story. Point a writer to an event, ten, twenty, twenty-five, thirty, forty, or fifty years in the past, and you can lay out the page before the text is in hand — none of those messy contingencies with stories that don’t pan out. No doubt such articles appeal to a “Hey, I remember that” nostalgia among readers, especially my fellows in the boomer generation, our waistlines expanding as our hairlines recede, as we struggle to see through our trifocals to the golden haze of youth. But the real reason for the proliferation of anniversary stories is that they are easy. Very little real reporting is involved; much of the information can be retrieved readily from the archive — rather like the partially masticated rodent tissue that owls deposit in the beaks of their young. Beyond that it is only necessary to round up a few people with a peripheral connection to the event and record their incisive comments: “Like, it was heavy, man.” And because our visual age demands images with stories, the photo archive is just sitting there to be exploited. Nothing could be easier. Click here to keep reading. Trust me, the story he tells is worth it. so, maybe Living should rethink the way it does the "Remember" oral history series? many of those get pegged to an anniversary.